This camp was transported via ice road from the Yukon River bridge crossing approximately 35 miles NE on the Yukon River. Ice was bad in some locations so we had strict weights and speed limits to ensure the safety of the crews. 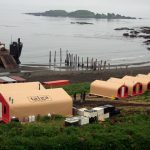 The camp supported a seismic operation with up to 85 people on site in the middle of winter of 2013 for about 90 days. Temperatures during setup regularly hit -50F and the Taiga crews and local hires powered through and setup the entire camp in under 14 days. 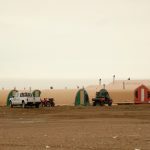 The camps are heavily insulated and heated by diesel drip heaters to ensure comfortable temperatures inside the tent structures even though it was -40F or colder for most of the project. Taiga also provided refueling operations for the six helicopters on site supporting the activities.